One of the many drivers to fall prey to a pit road speeding penalty and an off-course excursion through the grass of the Inner Loop, Blaney finished where he started, and in so doing improved his Sonoma finish by four positions. The Wood Brothers have now led the Open teams in 17 of 22 races, including three of the last five. When Blaney and team return to action at Bristol in two weeks, they will look to follow-up on one of their strongest runs of the year. In April’s trip to “Thunder Valley,” Blaney ran as high as 2nd before settling for 11th. Second among the Open teams for only the fifth time this year was Josh Wise and The Motorsports Group, who lost two laps early, earned back-to-back Lucky Dogs, and came home with his second-best finish of the year (trailing only a 24th at Kentucky). It was a step in the right direction for driver and team, both saddled with engine issues at Sonoma. Wise finished 33rd at Bristol in the spring. 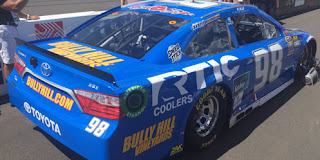 Cole Whitt returned to Watkins Glen with the same former Michael Waltrip Racing car that challenged for a good run at Sonoma, and this time brought additional sponsorship, including frequent Glen backer Bully Hill Vineyards. Whitt picked up where he left off in California, his pit strategy lifting him into the Top 15 when he caught a timely caution. During the big wreck on Lap 53, Whitt banged doors with Greg Biffle and made it through, but on the restart was bumped by Aric Almirola into Carl Edwards after David Ragan spun. The damage left Whitt by himself at the tail end of the lead lap, but still under power. Earlier this year at Bristol, Whitt ranked 2nd among Open teams, coming home 28th. Premium also brought back the #55 Chevrolet that Cody Ware attempted to get into the Sonoma race. This time, the car ran without sponsorship and had Alex Kennedy behind the wheel for the first time in 2016. Kennedy kept his nose clean, was in position to get his lap back when Kurt Busch took the lead on Lap 50, then stalled during his teammate Whitt’s accident in Turn 5. The car eventually refired, only to lose the engine down the front straightaway on Lap 77. Next time out at Bristol, Reed Sorenson is expected to return to this team, and looks to improve on his last-place run in the spring. None of the other part-time Open teams attempted the race in Watkins Glen.